Cats are cute and cuddly animals. The independent nature of cats makes them an ideal choice as pets. Cute and cuddly cats will play and enjoy all the things that you do at home and they will not complain. Cats become your family member almost instantly because they adjust to the surroundings quite easily. Even though cats look cute and adorable, they can be really silly when you give a cat bath. 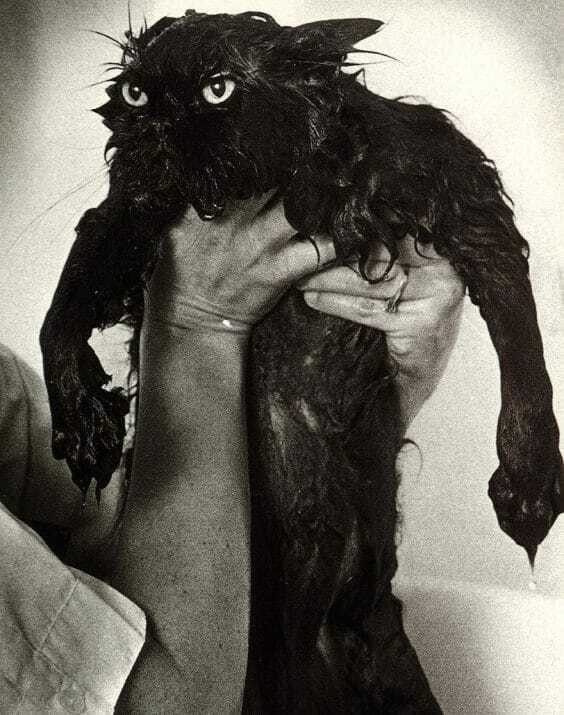 It is a known fact that cats hate water and will never enjoy playing in water. A lot of domestic cats hate water because the wet fur makes their fur heavy and regulating their body temperature becomes difficult for these furry felines. Cats are used to cleaning themselves with their tongue and prefer to stay clean the whole day. 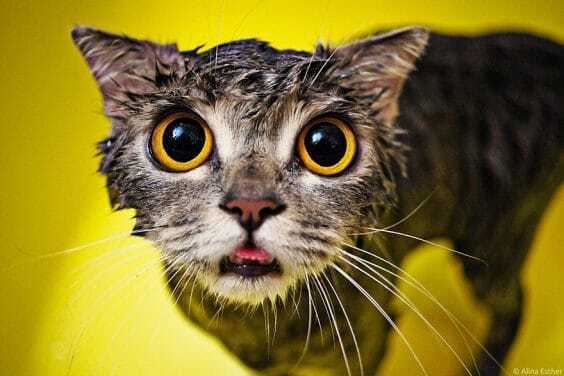 Since they bath themselves with their tongue on a regular basis, it is not a necessity to cat bath. Certain cat breeds like Norwegian Forest cat, the Turkish Van and a few desert breeds love water and are known as water cats. They love being around water and find it exciting to get inside the water. 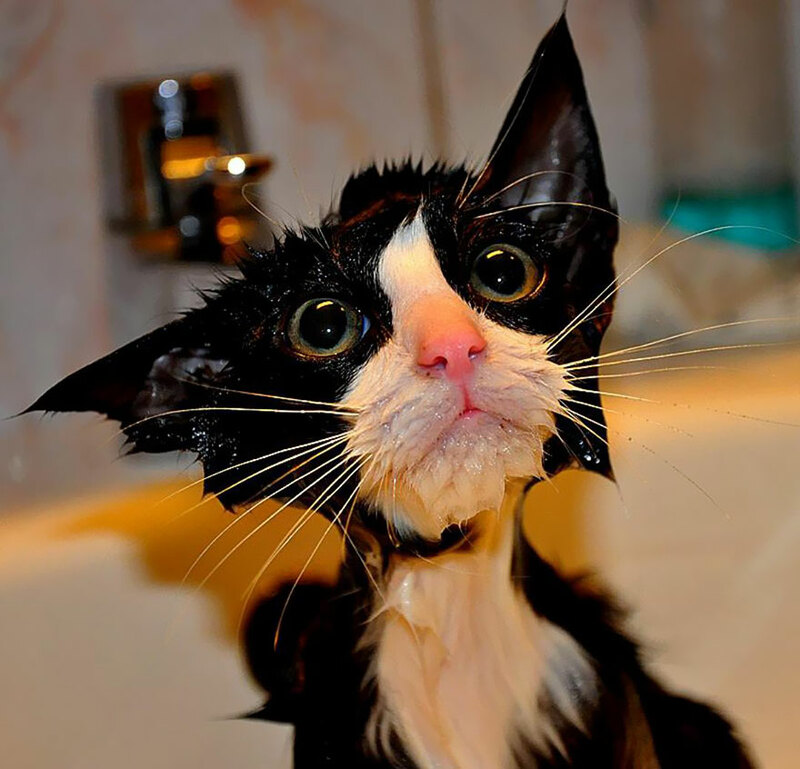 Cats are capable of loving water when they are kittens and when they come in contact with water early on in their lives. This removes the fear of water and they find it comfortable around water. 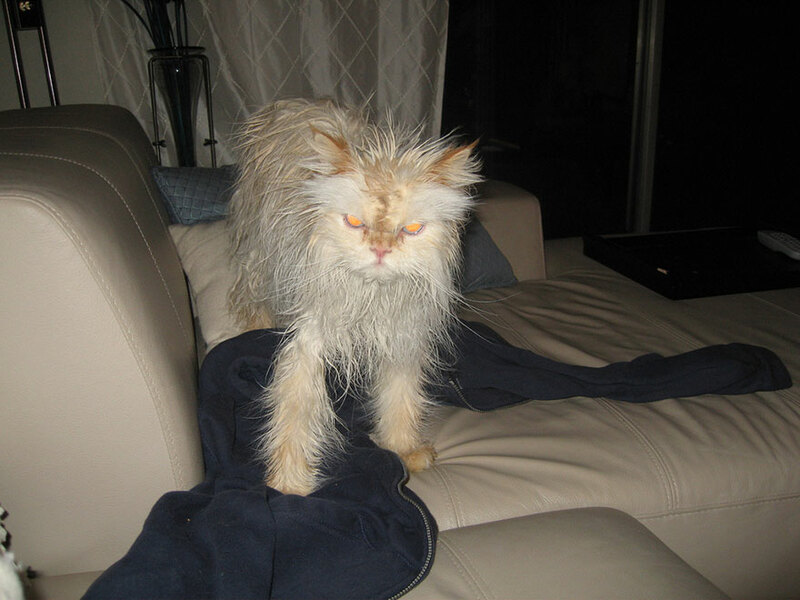 Housecats don’t come in contact with dirt or dust and hence don’t require a bath, but outdoor cats get dirty and may need a bath. 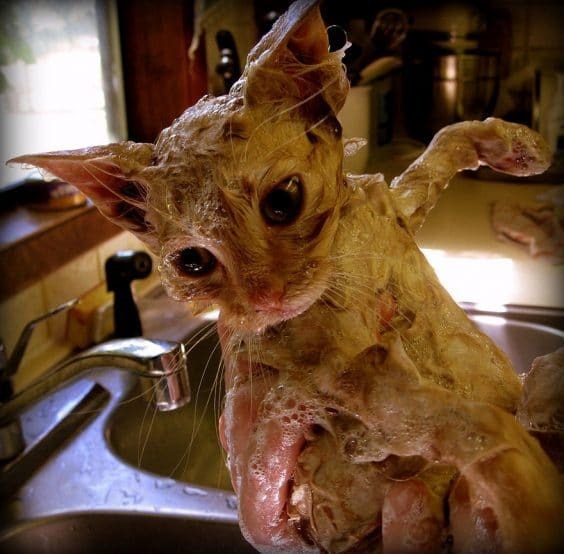 As long as your housecat cleans itself, there is no need for a cat bath. The following images of wet cats look hilarious, but make sure when you give your cat a bath, water doesn’t enter his ears as that can lead to infections. 1. This poor cat is very amused that his owner poured water on him and made him take a bath. He didn’t expect this from his owner. Look at his sad eyes, poor guy will never go near the bathroom ever. 2. This wet cat is very unhappy about getting wet and now he doesn’t want anyone to take his photograph. He doesn’t want his human friends to laugh at him and share it on the internet for others to see. 3. This blue-eyed beauty is all wet and wants him to be taken out of the water soon and wrapped in a dry towel. He wants to go out of this room to some place where he can get dry and relax after this harrowing experience. 4. 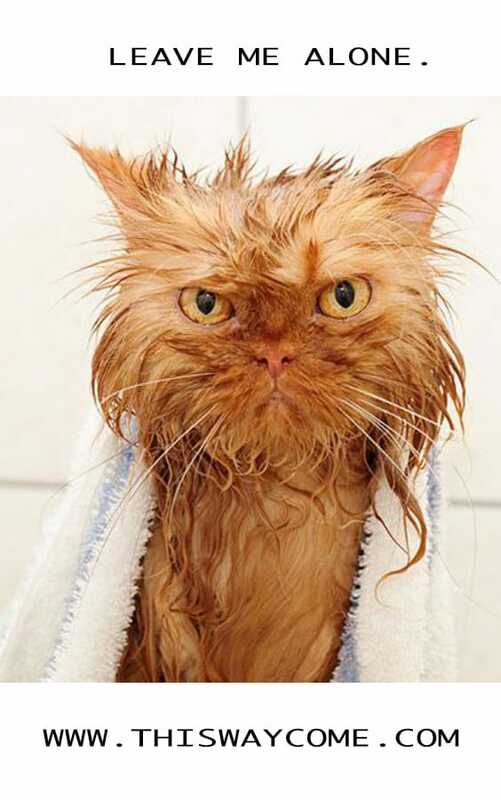 This water cat is pretty pissed up at his owner for getting him wet. If he could only talk, then there would be a lot of talking between both of them. He is certainly not happy about being wrapped in a towel as if that will solve the problem. He seems to be warning his owner for this act. 5. 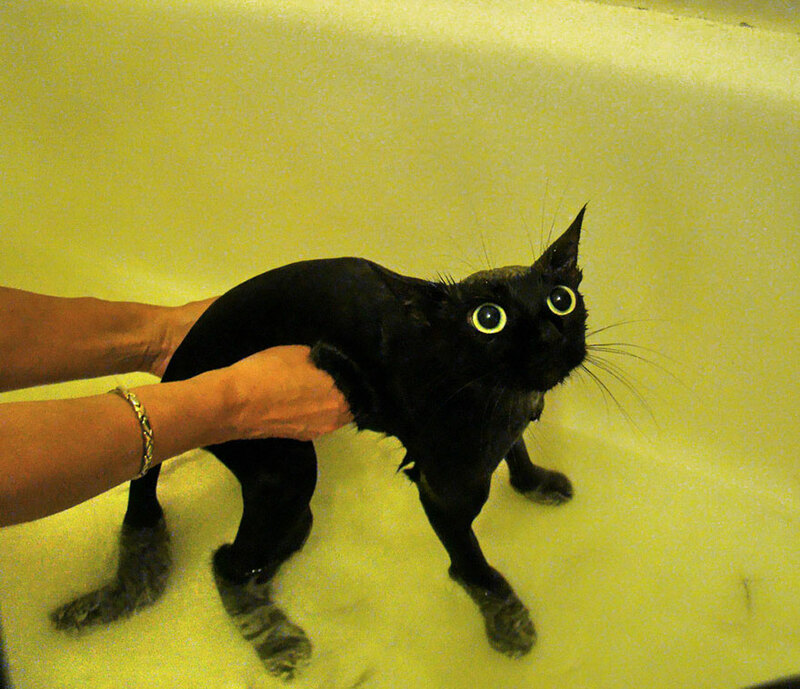 This water cat didn’t like the surprises. Look at the way he is staring at the cameras, not happy to say the least. You fooled me by offering me a treat and got me to the bathroom for this surprise, not good. 6. Difficult to say what has unsettled this little guy. 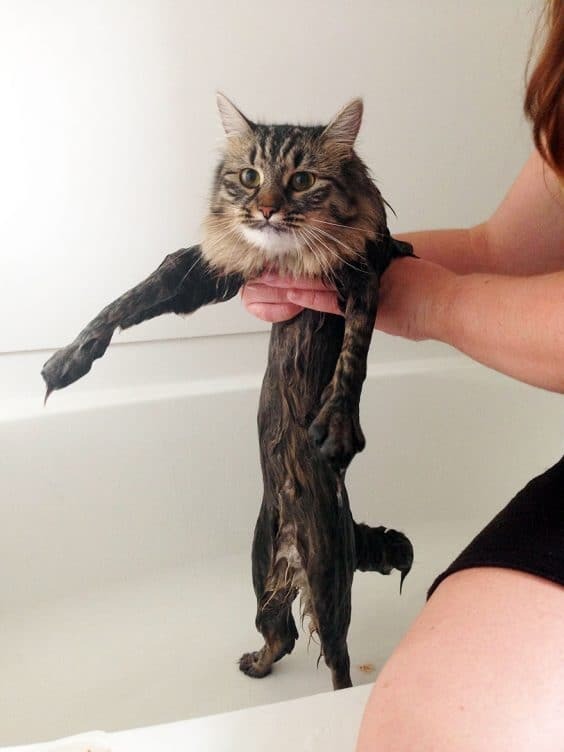 Is it the weird haircut or the cat cleaning process started by his owner? He himself doesn’t know how he must be looking; please get a mirror for him guys. 7. This wet cat looks stunned rather than being sad or happy about getting wet or taking a bath. Just a few minutes back this guy was thinking of getting something interesting to eat and now he is like this. Not expected. 8. Is it an alien or a kitten? This little one not moving at all in her owner’s hands, she has given up already. No chance of fighting now. She just wants the ordeal to get over soon. 9. This is a real angry young man look alike. He is warning everyone by showing off his sharp teeth. If he could talk, he would say you made me look like an alien and want to take photographs too. Keep your one eye open today while sleeping as this guy is not over yet. 10. 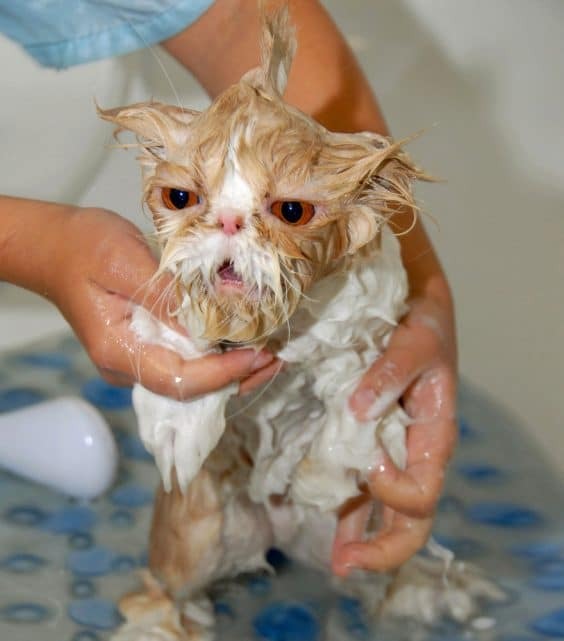 At least get my fur combed properly after this surprise bath. What if my friends drop by and see me like this. How handsome was I looking before, now I am not presentable at all? 11. Look at my before and after pictures, wasn’t I looking cute and cuddly. Now, I don’t look attractive at all. I had beautiful looking soft fur, now I look like my body is covered in rags. Feeling very sorry. 12. 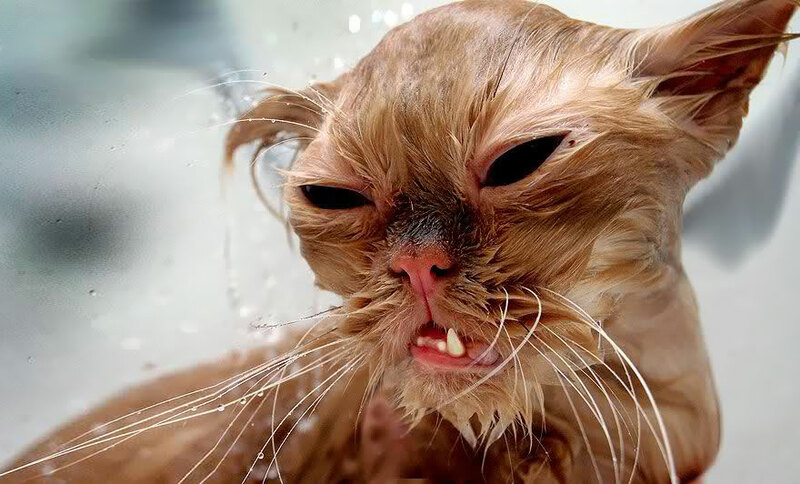 This water cat clearly seems to be comfortable in water. Looks like she has been in water before and knows what to expect. Both she and her owner are enjoying the shower. 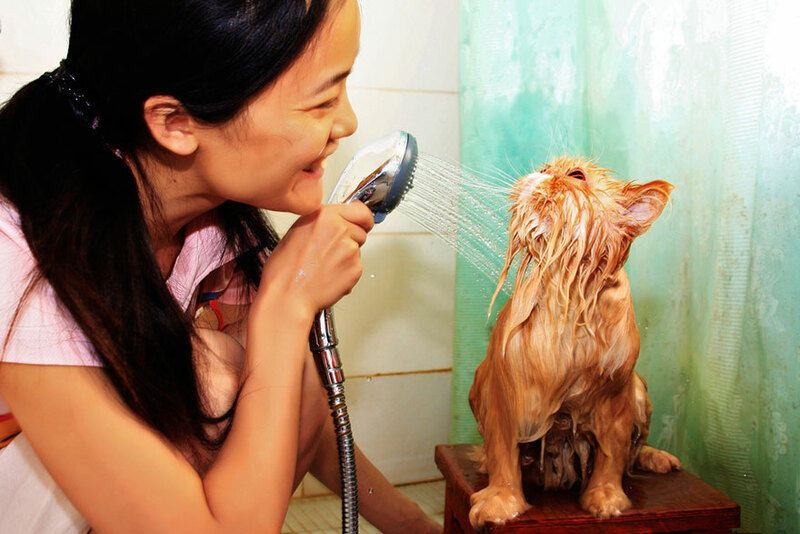 The cat cleaning session looks cool and less tiring for the owner. 13. Two cats taking bath together, this means the owner has given them both a bath lot many times earlier. Even the cats look comfortable and relaxed. Even the other cat looks quiet and cool about the whole process. 14. This water cat was very cooperative throughout the cat cleaning process that he got a nice big handshake from his owner. Way to go dear kitty. He will be a very happy cat once he gets his treat for behaving well. 15. 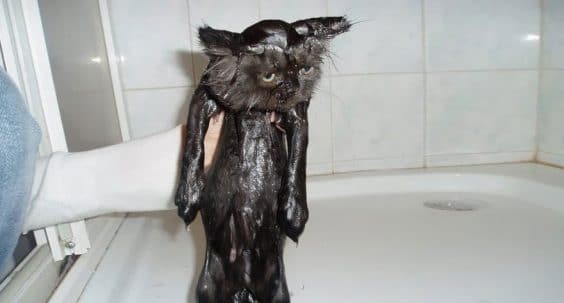 This kitten seems to be happy after the bath. He just wants to escape from this place and won’t be available for a longtime today. 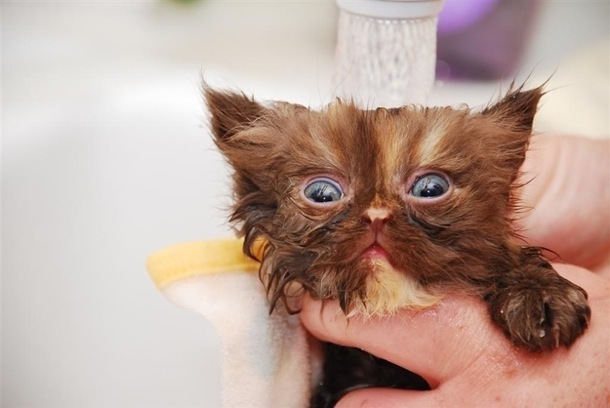 This kitten will surely enjoy his next cat cleaning session. 16. 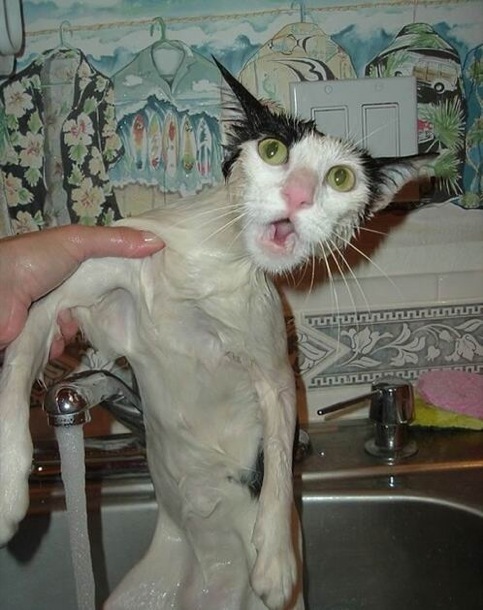 Oh My God didn’t expect the water to be so cold. At least you could have poured warm water over me, look at the temperature outside. Now, what if I fall sick after all this exercise. You should have been a little more careful. 17. 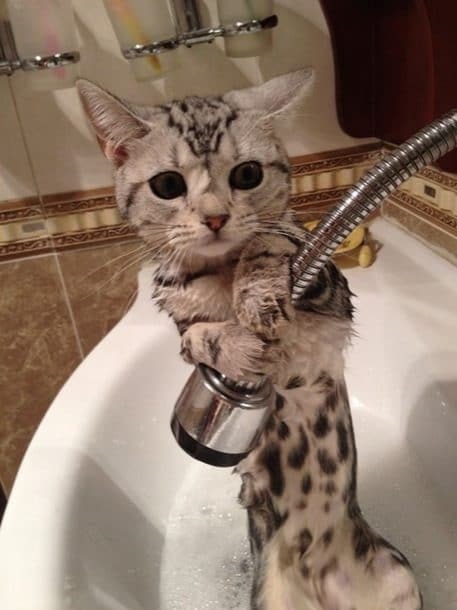 This cute kitten is all set for the shower, but the water seems to have stopped on the way. The tub is half filled with shampoo water, but he needs more water to swim. Eagerly waiting for the water supply to resume. 18. How do you annoy a cat? Place him in water and the there he is all annoyed and furious. To annoy him more, take him out of water and wrap him in a towel and take a photograph. 19. This image of the wet kitten tells that he will never trust his human friends next time. 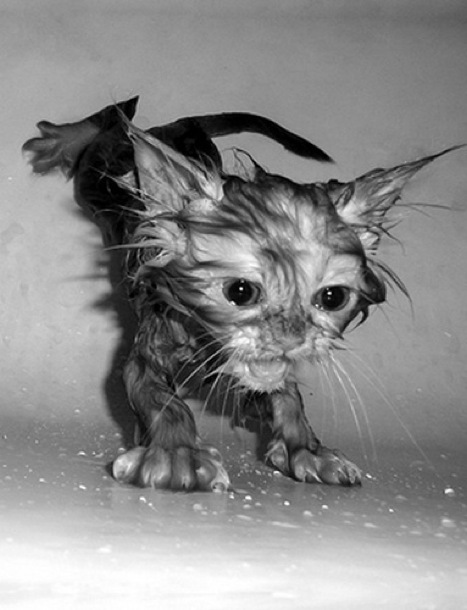 The photograph of the kitten tells all the emotions going through in his mind. 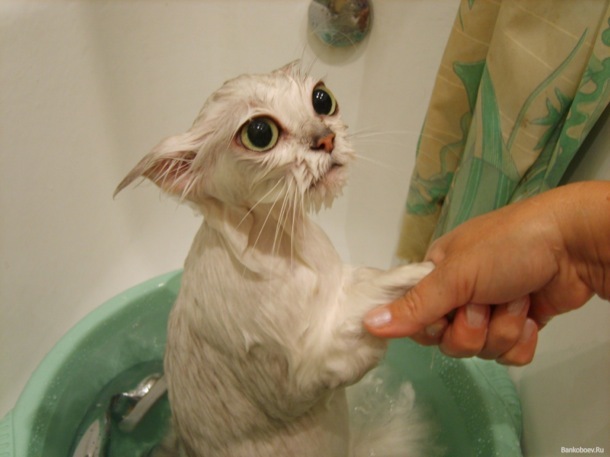 Look at the scared face of this cat. 20. This cat looks like he has been immersed in a black color solution. 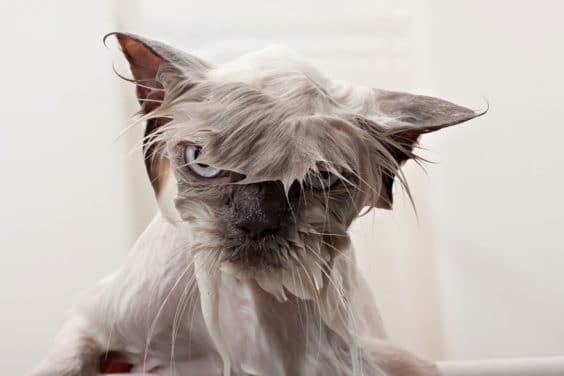 Now, he is thinking is this going to be my condition every time my owners decide to give me a shower. He just hates to look at himself like this, so helpless. 21. 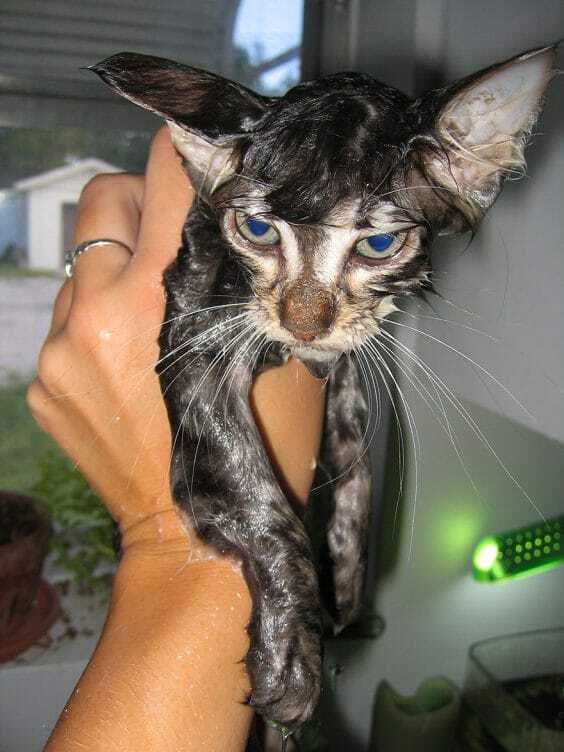 This kitty is dead scared of the bath time that he has decided not to cooperate next time. Look at the way he is trying to grip the surface; clearly you can see his discomfort. This photo shoot is not helping at all and he is clearly not happy about it. 22. This cat doesn’t want his head to be wet, but is fine with the remaining body. He looks like has lost a lot of weight and fur. He is okay with the water bath once in a few months and hates it if it is done frequently. 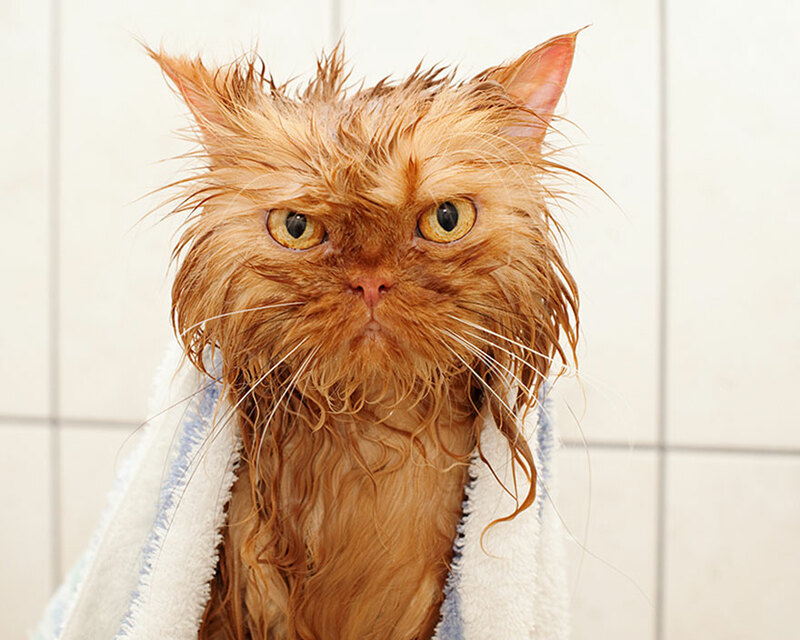 Finally, it is a known fact that cats hate water and don’t like taking cat bath. 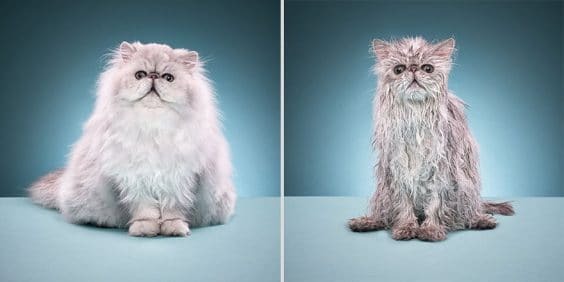 Even though the cats hate water, the photos look pretty hilarious and one can see the emotions of these cats on their faces when they are wet.